If there’s one thing that there never seems to be enough of, it’s time. Last night J and I were flipping through his work calendar and, because his schedule is set a year in advance, we were able to see that our free weekends over the summer are few and far between. During the summer of 2011, we managed to squeeze in only three camping trips but hope to almost double that this year. Over July and August, 2011, we found ourselves at Silver Lake, Washington, on Hornby Island and at Birkenhead Lake near Pemberton. 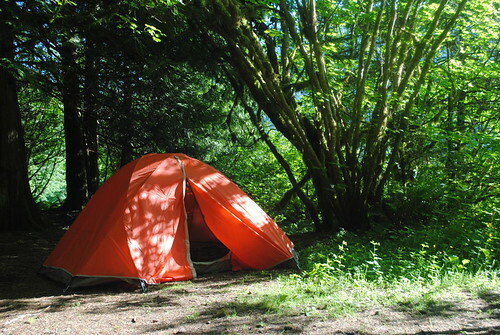 While I’ve already managed to book a five-day weekend so we can explore the Oregon Coast this July, we are looking to plan and book other camping hot spots for the summer months. Where are some of your favourite places to go camping? Do you have any hidden spots you’re willing to share? Indian Arm is pretty fun if you are into kayaking. Cathedral Park is very pretty as well but it’s a bit of trek in. Have fun in Oregon! I have gone up and down the coast a few times! I don’t have any favourite spots, it is all beautiful! Also Star Lake just outside of Wells Grey. Jasper and Banff were nice too. Though we’d like to explore more of those area again.